Five of masterpieces by Akira Kurosawa,including the previously unreleased The Lower Depths and Dodes__ka-den, explore the complexities of life. 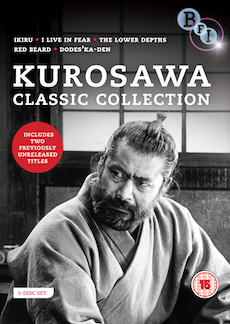 Akira Kurosawa has been hailed as one of the greatest filmmakers by critics all over the world. This collection brings together five of his most profound masterpieces, exploring the complexities of life, and includes two previously unreleased titles – The Lower Depths and Dodes'ka-den. Featuring a beautifully nuanced performance by Takashi Shimura as a bureaucrat diagnosed with stomach cancer, Ikiru is an intensely lyrical and moving film which explores the nature of existence and how we find meaning in our lives. Made at the height of the Cold War, with Hiroshima and Nagasaki still a recent memory, Toshiro Mifune delivers an outstanding performance as a wealthy foundry owner who decides to move his entire family to Brazil to escape the nuclear holocaust which he fears is imminent. This Maxim Gorky adaptation, in which the inhabitants of a slum while away their time longing for escape or dreaming of a better life, is a brilliant exploration of the conflict between the comfort of illusion and bitter reality. Akira Kurosawa's first film in colour follows a group of people living around a city dump and is by turns both tragic and transcendent. Made at a critical point in his life, Kurosawa poured himself into this film and negative reaction it garnered resulted in a suicide attempt.